Interstate Products Inc. (IPI) provides tips and advice on the best way their customers can handle rust problems. A rust converter is the best choice if you don’t need a bare metal finish, such as on an old wrench. If you will eventually paint the object – such as the outside of a storage tank, an automotive body part or frame, a fence railing – a rust converter and primer all-in-one is probably best, such as “1” Step (The Rust Killer) rust converter. "1" Step (The Rust Killer) rust converter neutralizes existing rust and acts as a smooth long lasting primer on both rusted metal and previously painted surfaces. "1" Step (The Rust Killer) rust converter can be sanded, top-coated, body puttied or left as is. “1” Step (The Rust Killer) rust converter eliminates sand blasting and heavy wire brushing. “1” Step (The Rust Killer) rust converter quickly kills the rust and neutralizes it completely, converting the rust to a non-ferrous substance so the rust is gone. The primer like surface that remains cannot rust again. “1” Step (The Rust Killer) rust converter has been around for more than 20 years; it is one of our most popular products with through the roof ratings! Prep time is minimal and it dries in about 30 minutes. Water based "1" Step (The Rust Killer) rust converter works by a chemical reaction to eliminate rust and covers up to 500 sq. ft. per gallon. It is non-toxic and contains zero VOC or HAP. Safer to use then latex paint. Dries in 30 minutes into a black* protective coating. Gives 2 to 4 times the rust protection of acrylic or enamel paint without a top coat. *The final color of black may vary depending on the stage of rust the “1” Step (The Rust Killer) is used on. Use “1” Step (The Rust Killer) rust converter on: structures, machinery, equipment, vehicles, railings, marine applications, and more. There have been tens of thousands of successful applications. Not for use on very hot parts like engines, exhaust pipes, tail pipes. Not for use on the inside of liquid containers like fuel or water tanks. 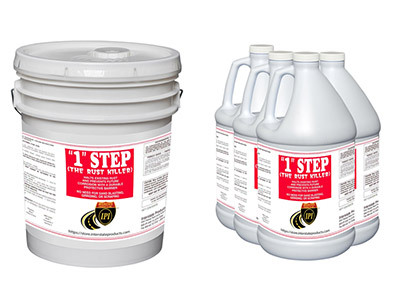 “1” Step (The Rust Killer) rust converter is available in 1 gallon, 5 gallon, 30 gallon and 55 gallon containers. If you want the end result to be exposed, bare metal, then a rust remover is better suited for the task. For example; an old hand tool, like a wrench or screwdriver. For a bare metal finish you can use acids, a wire brush, a power drill grinder or brush or a sand-blaster. Caution – most acids are extremely corrosive and hazardous – consult local and federal regulations, as well safety requirements for storage and handling. Also, acids take longer because they need to soak in to eat away at the rust. IPI’s new Rust Remover Concentrate is a true breakthrough cleaner. With a pH of 1, this multipurpose cleaner generates the high cleaning power of an acid, yet it is safer and mild to skin like liquid dish soap. The remarkable Rust Remover Concentrate formula contains a special blend of surfactants, organic salts and proprietary additives to create an acid-replacement cleaner that is biodegradable and safer for the environment. The Rust Remover Concentrate is highly effective against rust, calcium, scale and lime deposits, soap scum, stains and soils, hard water stains, beer stone/milk stone, scuff marks, and grease.